You can add different email addresses, change your preferences and passwords, and also reset your two-step authentication. 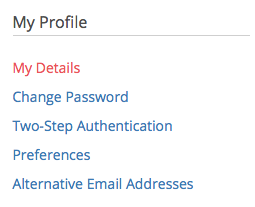 You can update your personal details directly on your account. Navigate to the top right-hand side of your account and click on the Cog icon. My Details - You can change your name and email address. If you have Two-step authentication enabled you can reset if you have a new device. Preferences - In the Notifications tab, you can turn on which email notifications you would like to receive. In the expenses tab, you can decide on your expense preferences. Alternative Email Addresses - Add alternate email addresses to your registered email address for using the email-to-receipts feature.